Home » What is a Keepsake Ornaments Wish List? Find the answers here! 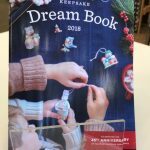 What is a Keepsake Ornaments Wish List? It’s a list where you can mark the Hallmark Keepsake Ornaments that you want, as well as the quantity you would like of them. You are welcome to keep this list for your own records as you purchase ornaments on each of the release dates to be sure that you get all of your favorites. Or you can turn in your Keepsake Ornaments Wish List to us – see below. What happens if I turn in my Wish List to either of the Ryan’s Hallmark Shop locations? We will fill your requests (in the order we received the lists) before we even stock our shelves. You can pick up your ornaments at your convenience when they arrive at our stores. You are then welcome to examine the ornaments and decide which ones you want to purchase. How do I get a Wish List? One is included in the middle of each Keepsake Dream Book. You can easily detach it. Pick up a Dream Book today at either of our Orlando locations. If you are a Keepsake Ornament Collectors Club member, one is included in the kit that was mailed to your home. How can I deliver my Wish List to my favorite Ryan’s Hallmark Orlando location? Email it to us at: info@RyansHallmark.com. Please indicate the store location where you will be picking up and purchasing your ornaments. We will reply to confirm that we have received and entered your Wish List. Have questions about your Keepsake Ornaments Wish List? Contact us at your convenience – our Ornament Experts are here to help with all of your questions and all of your Keepsake Ornaments needs!